Some personal trainers and “health gurus” don’t believe in logging calories. Instead, they say “eat when you’re hungry.” I don’t agree with that. I know from experience that eating below or too far above the amount of calories your body requires (for muscle gain, fat loss, or maintenance) can sabotage any prospect of reaching your goals. For someone serious about reaching athletic and/or aesthetic goals, not tracking your calorie and micronutrient needs is the equivalent of winging it and hoping for the best — it’s simply lazy. When I started working out in 2002, I had no clue how to eat for optimum health and fitness. In fact, I thought it was okay to barely eat anything at all. From age fourteen to sixteen, I went back and forth between anorexia and bulimia (both are very illogical are hard to keep up). When I found out I was pregnant in late 2001, logic told me that I needed to eat for my baby’s health. So I decided to attempt what I considered healthy eating (Nuri-Grain bars, whole wheat bread, salads, salads, salads). After having my son, I had no excess body fat. However, I still had skewed ideas about nutrition, and I was still under-eating, so much so, that my breastmilk looked like skim milk. I was looking in the wrong places for nutritional advice: magazines, TV ads, and word of mouth (from non-experts). In 2005, I decided to end my confusion and purchase a personal training course. The $600 price tag became a lifelong good investment. I learned the basics of nutrition, and the greatest nutritional fat loss principle (everyone has heard at least once): eat smaller, more frequent meals — which in turn tricks the metabolism into speeding up. I went from eating sparingly to eating 5 small meals per day. That single change produced the most visible and positive difference in my body in the three years I had been training prior to then. I finally attained a year-round six pack, but I soon noticed there was a limit to how far I could take my body with a standard personal training course; I struggled with overall muscle growth. In 2007, I dug around the internet and found glowing reviews and recommendations for Burn the Fat Feed the Muscle, a nutritional book that focuses on peak athletic shape and fitness written by Tom Venuto. Later, I purchased Championship Bodybuilding by Chris Aceto (a recommended read in the back of Tom Venuto’s book). These books combined, transformed my body into that of a fitness model. Do you call yourself an athlete? 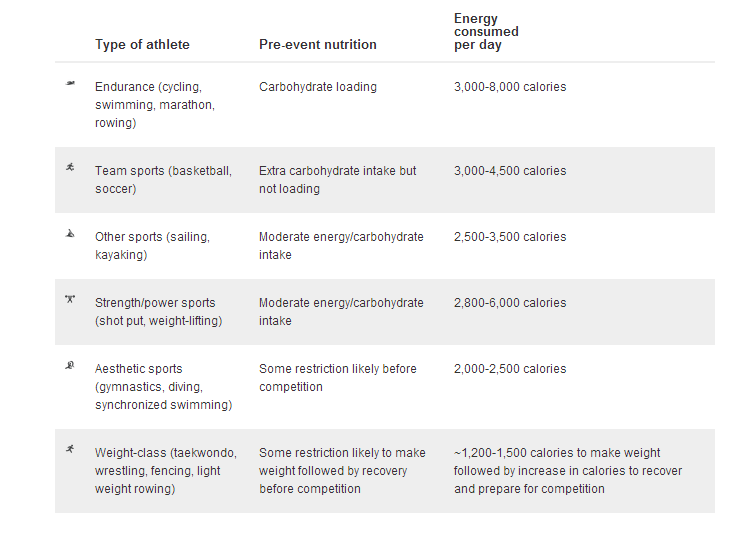 Below are the average caloric requirements for professional athletes. Technical stuff: To determine your caloric needs, you need to be aware of your activity level, body fat percentage, and weight. Your body composition (fat to muscle ratio), combined with your activity level, determine how many calories you burn per day. From there, you can find out how many calories you’ll need to support muscle growth, maintenance or fat loss. The best method for determining this is the Katch-McCardle Method. As a general rule, you should NOT eat below 20% of your “maintenance level.” If so, you will actually slow your metabolic rate and possibly lose muscle. To find out your maintenance level, go to the link below and follow the steps in the calorie calculator. Learn about maintenance level here. As a general rule, in order to grow muscle, you need to eat above your “maintenance level,” somewhere between 100-500 extra calories. Higher amounts make sense if you’re doing intense activities, such as powerlifting or if you’re active all day. However, for most people, exceeding 400-500 calories above their maintenance level can lead to fat gain. Don’t log vegetables, they have a negative caloric effect. Logging vegetables can give the illusion that you’re eating enough calories when, in reality, you might not be. Peppers, green apples, and several other foods have a negative caloric effect as well. Look it up. Good news: Once you get used to eating a specific way, it’s no longer necessary to log calories every day. However, if you start falling off track, it may be wise to log every now and then to get back in a steady caloric and macronutrient pattern. Meeting your nutritional requirements within 100 calories or a percent or two of your macronutrient ratio goals is good enough for results — no one is perfect. Lastly, every time you change your goal (ex: summer slim down, muscle gain), you should determine your caloric needs and macronutrient ratio to reach that goal and follow it — if you’re serious about reaching it.